Having been relocated to the Kuhmo area from Suomussalmi, Siilasvuo’s division (new 9th D) failed to achieve a quick victory there. At the end of January, the division launched an attack with the aim of destroying the enemy rifle division (54th RD) that had been stopped by Brigade Vuokko and Group Ilomäki. This attack resulted in hard motti battles, in which some of the surrounded enemy units held their positions until the end of the war. At the end of January, the majority of Siilasvuo’s division (9th D), which had fought successfully in Suomussalmi, was transferred to the Kuhmo area. All the troops deployed in the area were subordinated to the command of the division’s commander, Colonel Hjalmar Siilasvuo. 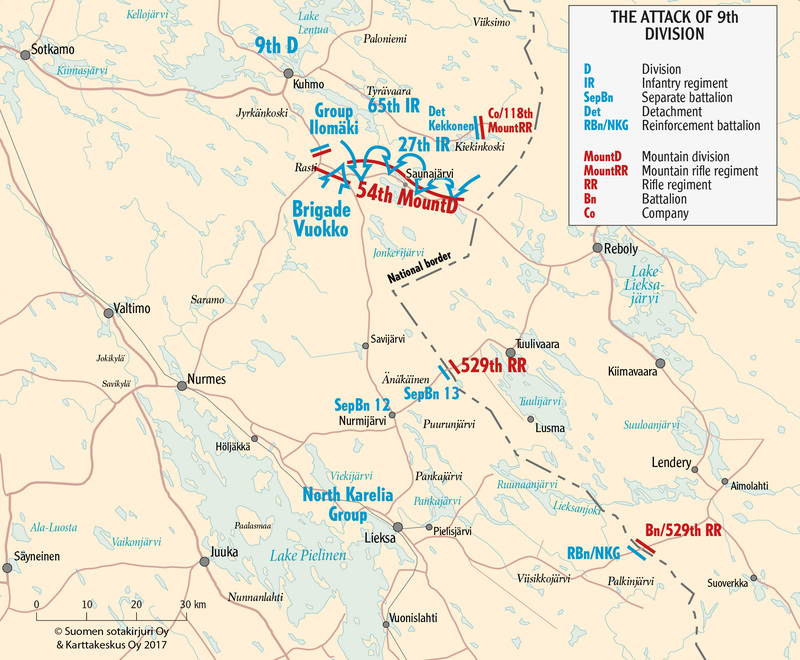 Siilasvuo’s division had two infantry regiments (65th IR and 27th IR) which had been relocated from Suomussalmi, Brigade Vuokko, which was a little under a regiment in strength, and Group Ilomäki, which consisted of a few battalions, at its disposal. On 29 January, the division launched its attack to destroy the Soviet mountain division (54th MountD) that had placed itself in an advance formation. The attack did not achieve its main goal. The fighting continued until the end of the war. With its attack, Siilasvuo’s division (9th D) succeeded in cutting off the enemy division’s (54th MountD) road connection to the east through Kilpelänkangas and in dividing the enemy troops into several pockets, known in Finnish as mottis. The battles to destroy the mottis continued until the end of the war. The hardest motti battles were fought against the triple motti of Luelahti. 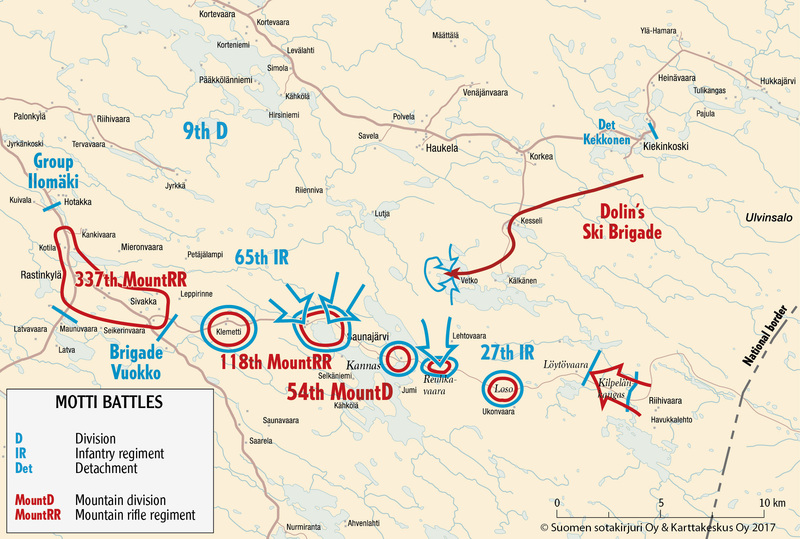 The Soviet troops trapped in mottis in the Luelahti area included a mountain rifle regiment (118th MountRR), the commander of the mountain division, Brigade Commander Nikolay A. Gusevsky, and the division’s headquarters, among others. The Finns succeeded in capturing two of the three mottis before the end of the war. Out of the other larger mottis, the Finns were only able to capture the motti of Reuhkavaara. 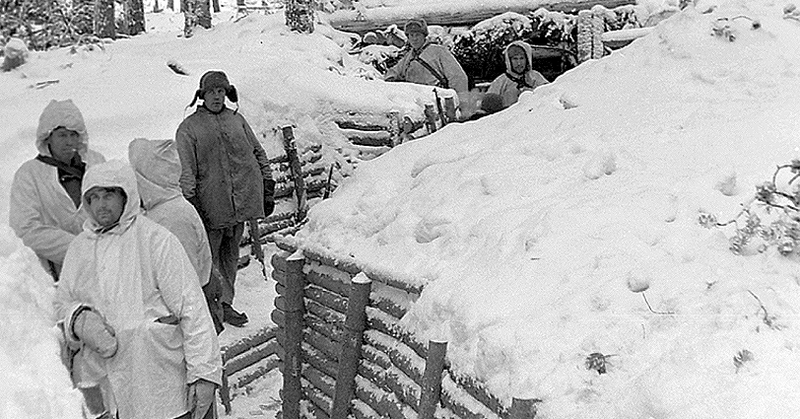 Soldiers of the Kuhmo area in a trench. The time and place are unknown. SA-kuva. The 9th Army tried to open a road connection to the division trapped in a motti by launching attacks from the direction of Repola (Reboly). The hardest battles fought to repel these attacks took place in Kilpelänkangas. Siilasvuo’s troops were forced to abandon the area at the beginning of March. The Finns held their subsequent defensive positions in the Löytövaara area until the end of the war. In February, the 9th Army deployed Dolin’s ski brigade (SkiBde), which had the strength of approximately three battalions, through forests to assist the army’s mountain battalion (54th MountD), which was trapped in mottis. It was destroyed by Finnish forces in the Vetko area before it managed to make contact with any of the mottis.